This week we wonder if the Universe is going to collapse and then expand again, how satellites can have such different velocities, and the size of the observable Universe. Is it possible the Universe will stop expanding and fall back into itself, and has this happened before, perhaps an infinite amount of times? 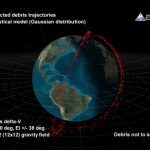 The collision between the two satellites in Feb. 2009, shouldn’t the two velocities of the two satellites been similar? How big is the observable Universe and how far away are objects we’ve observed? Do naked singularities have the same properties as normal singularities, and if so, would naked singularities form an event horizon? What is the Helix Nebula (The Eye of God)? Could there be lots of microscopic black holes zipping around us and could they be dark matter? How does the energy of the Universe remain constant, and is this an explanation of vacuum energy? Do black holes swallow dark matter and dark energy? What operating system to most professional astronomers use and what’s best for astrophotography? If space is expanding is new vacuum energy being created? If the Moon formed from a collision between Earth and other object, would that have affected the Earth’s rotation? What would happen if Jupiter crashed into the sun? Fraser Cane: Hey Pamela, you’re still in the UK when we’re recording this? Dr. Pamela Gay: I’m still in the UK, we have daffodils everywhere here but it is also cold. Fraser: This week we wonder if the universe is going to collapse and then expand again, how satellites can have such different velocities and the size of the observable universe. If you have a question for the AstronomyCast team, please e-mail it in to infor@astronomycast.com and we’ll try to tackle it for a future show. Please include your location and a way to pronounce your name. Let’s get on with the first question. Let’s kind of break this question apart Pamela. Is it possible that the universe will stop expanding and fall back in on itself? Fraser: Okay [Laughter] next question. That used to be the thinking right? Pamela: Well yeah and it wasn’t that that was the thinking it was that was one of the possibilities. We didn’t know how much mass per volume what the mass density of the universe was. Without knowing the mass density of the universe and also without knowing what is causing how much dark energy there is without knowing if there is some sort of cosmological constant, we had no way of being able to differentiate between a universe that is going to expand forever, a universe that’s going to collapse back in on itself and a universe that given infinite is basically going to stop. We were left with these three different possibilities mathematically. It wasn’t until within the past ten years that we really got the observational handles that were necessary. Especially with WMAP back in I think it was 2002 or early 2003 without those results, we really didn’t have a good feel for the fate of our universe. Fraser: This was the big surprise, right? Astronomers were trying to answer this very question: will the universe collapse back down? Will it go on forever? It was like how much momentum did the universe get from the Big Bang? The answer was completely surprising. This is not what they were expecting. Pamela: Right and as we’ve learned from the 1998 supernova results there is this mysterious dark energy force that is pushing the universe apart. So it is no longer just a matter of figuring out how much mass there is causing the universe to gravitationally collapse. Now we have to balance out gravity against dark energy. I suspect that Brian is going to kick himself when he hears our answer. Pamela: It is the good old if you have two people both going 30 miles per hour. If they’re going at right angles to each other and collide in the middle of an intersection they have a fairly significant closing velocity. It is even worse when they’re going head-on. I don’t know the exact orbits of these two spacecraft. Fraser: If I remember correctly we did a bunch of articles on Universe Today, it was right angles. Pamela: Okay, so we have basically this intersection crash that you might get with two low speed cars that still leads to a high speed collision. Here we have two satellites that are whipping around the planet as often as every 90 minutes. Get them going to a right angle to one another and it is easy to be able to get that high of velocity very quickly. Fraser: Just use the analogy, imagine the intersection, and have one car coming in at 100 kilometers an hour and another one coming in at 100 kilometers per hour at right angles to each other. They will still do some damage to each other. That’s it. I think if you get the two satellites in exactly parallel orbits in the same trajectory then yeah, the closing speeds are not that dangerous. Think about what happens with the space shuttle docking with the International Space Station. They’re in trailing orbits. The shuttle is launched in exactly the same orbit that the space station is and then it sort of fine tunes its speed until it is able to dock and not take it out of space. In this case it was just two satellites that happened to crash. It was not planned at all; they were going in completely different directions at the same orbital height. So Pamela, how big is the observable universe? Pamela: The stuff that we’re able to see is located within a radius of 13.7 billion light years. Fraser: Right, that’s the age of the universe and that’s the distance to the beginning of the universe the distance with time to when the universe began? Pamela: What’s interesting is because the universe is expanding, this stuff that we’re able to see is no longer located within the same sphere, the same 13.7 billion light year radius. Instead it is now located 46.5 billion light years away. The expansion of the universe has carried the material we’re able to see as it looked in the past to be significantly further away today. Fraser: The cosmic microwave background radiation that we see as being 13.7 billion light years away has moved to 46.5 billion light years away. That’s a radius right? We’re looking at a sphere that is like 90 billion light years across. Pamela: It’s a big place out in space. Fraser: Yeah and that’s the observable universe. On our show we actually cover that in great detail as well, how big is the universe. We covered what is the center of the universe, what is the shape of the universe and Episode number 79 is “How Big is the Universe?” We actually covered this in great detail. We talked about how big the whole universe is, how big the observable universe is and talked about why it is actually such a complicated question. Things are moving and expansion is accelerating. Pamela, what is a singularity? Pamela: A singularity is basically just a black hole. It is any place in space that creates a gravitational field so strong that light isn’t able to escape from some place near its surface. Fraser: So what is a normal singularity, like a normal black hole? Pamela: It is just an extremely dense blob of material, normal matter that has been condensed to a point that physics is no longer able to really understand what happens to the particles. There’s a certain point above the surface of that black hole where light can’t go fast enough to escape. Anything that crosses that event horizon – since nothing can go faster than the speed of light – anything that crosses that event horizon is trapped and in most cases will eventually fall down to the surface of the black hole and become part of the black hole. Fraser: So then what is a naked singularity? Pamela: This is something we’re not sure if it exists or not. There are theories that say that if you take a dense enough blob of mass, a black hole basically, and you spin it fast enough the effects of the spinning will cause the event horizon to flatten, flatten and flatten until eventually you end up with the event horizons merging down into the top part touches the bottom part and essentially goes away. This ends up allowing you to look down and see this mysterious whatever it is that is within the event horizon of the black hole. These are purely a mathematical invention. They exist in science fiction. There are theorists who believe they may exist in the real world. There are models that show that in some conditions if you explode a supernova just right you might be able to get a system rotating fast enough to create a naked singularity. But one has never been observed and the probability of this is actually really quite low. Fraser: I guess the gist is that it is the rotation speed that is going so fast that it is counteracting the gravity, right so that you can see it? Pamela: Counteracting the gravity is too strong a word. It is the way general relativity works within a rotating framework changes. You end up with we talk about centripetal and centrifugal forces being fictional but you spin something fast enough and it will spread out like a pancake. All of these things come in and the gravity is still there. It’s just the fact that its spinning changes the physics of the system. Fraser: To go back to Matt’s question, why wouldn’t it create an event horizon from the extreme gravitational force? I guess it is sort of by definition, it is the spin that says why it wouldn’t. Pamela: The event horizons are formed, they just flatten out as well such that you end up with basically an event disc around the object. The singularity itself is revealed above and below this flattened event horizon that potentially will eventually go away. It is all about the spinning. Fraser: Would you be able to escape one? Fraser: But wouldn’t light be escaping it? You can see it. Pamela: You wouldn’t be able to escape the singularity. Again, we don’t know if these actually exist. So you’re starting to go off the facts based journey into the random, great barren eon. Fraser: Right, imagination based journey. Now this is a very famous Hubble image where you see this – if you’re near a computer Google it and we’ll have a link in the show notes – but it is a beautiful image of what looks like sort of spiraling eye. So, what is it? Pamela: It is nothing more than the place where stars died. Our own sun will actually someday create something that is physically related to the helix nebula. You take a roughly solar mass star, give or take some, and as it dies it eventually puffs off its outer atmosphere. As that atmosphere drifts away and is eliminated by the remaining white dwarf in the center of the system you can end up with these fascinatingly complex nebulae. The helix is just one of dozens of near enough planetary nebula that we see these amazing images that allow us to see structures that are hard to explain. We’re still working to figure out what’s going on. In some cases it could be that there is a planetary disc that affects the way the materials streamed away. In some cases it is interactions with the gas and dust that already existed surrounding the star. As the star breathes away its outer atmosphere that material collides with the surroundings leading to asymmetric blobs of material essentially. All sorts of different interesting physics cause each of these planetary nebula to look truly unique. Their color comes from what lines of gas; oxygen for instance, creates the amazing green you sometimes see. All of these affects work to make every planetary nebula unique, but they all started out as just a plain everyday star. Fraser: Like our sun – this is the future of our sun. That is pretty amazing. It is an amazing picture. I love planetary nebula and I especially love to look at them with a telescope. One of my go to objects is the Ring Nebula. Pamela: The L nebula is one of the most fabulous if you have a slightly larger telescope or really good skies and a little tiny like 4 meter eye piece or so. So Pamela, are there probably zillions of microscopic black holes zipping around us? Pamela: There could be some microscopic black holes zipping around depending on whose theories you read. This is the type of thing where the theorists still haven’t been constrained by observations. Fraser: I think we did an article on this at one point and they are saying that they can’t form naturally now but they could have been created in the Big Bang. Pamela: Right and we know the black holes decay. We just aren’t entirely sure of the timeline in which they decay. So it is possible that in some of the more realistic but still have microscopic black hole theories, it is possible that there is about one per solar system sized volume of space. That doesn’t quite add up to zillions. The thing is that when a black hole does eat a particle it emits a bit of light as the particle comes in and gets accelerated. If we had clouds and clouds of microscopic black holes forming the dark matter that we know surrounds regular galaxies and galaxy clusters that we can see changing the shape of light from background objects due to gravitational lensing. If all of these were microscopic black holes as light passed around them, as gas and dust zipped through space, it would be causing these little microscopic black holes to occasional flicker like fireflies. his is where we’re looking at super symmetric particles. This is where we’re trying to imagine that maybe there is an entire class of particles out there that we have yet to imagine. Fraser: If it were microscopic black holes we would see flickering from photons and chunks of mass being gobbled up by the black holes and we don’t see that. That’s cool. Pamela, does the universe satisfy the law of conservation of energy? Fraser: Is the universe neither creating nor destroying energy? Pamela: Mostly. This is one of those kinds of confusing things where no one quite understands dark energy. For whatever reason it seems to have constant energy with volume so as the universe gets bigger the amount of dark energy increases. But we’re going to ignore that right now and go with energy that we do understand. One of the things that is talked about in this question is the energy that comes from gravity – the gravitational potential energy. All the energy that is out there that causes my keys to accelerate toward the floor that causes apples falling out of trees to accelerate toward the ground, all of that energy does remain constant as the universe expands. It’s just getting spread out more and more so that the total energy that is locked up in matter, the total potential energy that comes from various electromagnetic interactions, the total energy that comes from gravitational interactions, that energy remains constant across the universe. What changes is how much of that energy is locked up in each cubic meter of space. Fraser: If you were going to measure the amount of energy in the universe down to the nearest joule and I guess you’d also want to measure the amount of stored energy in all of the mass of the universe down to the nearest joule, that number, whatever that number is, has always been the same. Since the universe began and forever and forever. Pamela: As best we understand. Fraser: But it will just be spread out over a larger and larger volume. Except for dark energy and that’s kind of crazy and we don’t get it yet. About vacuum energy then, does vacuum energy play into that? Pamela: We think that vacuum energy and dark energy might be the exact same thing. This goes into the we still don’t know what dark energy is. Come back to us. Fraser: We kind of know what vacuum energy is, right? Pamela: Well the idea of vacuum energy is the universe isn’t at its lowest energy state. So, there is this constant energy everywhere and out of this energy you have a constant flux of particles that are forming, colliding and annihilating in the process over and over and over. Exactly what happens, how things cancel out could lead us to dark energy. Fraser: Right so putting dark energy aside the universe is balanced and when you bring dark energy in we honestly just don’t know yet. That’s all we’ve got. Pamela: It should be swallowing dark matter. Fraser: It should be swallowing dark matter? Pamela: Dark matter interacts gravitationally just fine. Fraser: I guess it’s just if a dark matter particle makes its way into the event horizon of a black hole in it goes. Pamela: Right. What we don’t know is what the heck dark energy is. Without even having me starting what the heck is dark energy, we really can’t say anything. Fraser: Right and so we haven’t really observed any interactions between dark energy and black holes. Does dark energy have interactions with gravity? Pamela: We don’t know. It is sort of like asking does the force of gravity get sucked into a black hole. No the force of gravity escapes quite nicely. What we don’t for certain is if dark energy is some mysterious force we haven’t defined yet. We don’t know if it is some weird field that we haven’t defined yet and so we really can’t say anything. Chris Manis asks: “What operating systems do most professional astronomers use and what is best for astrophotography?” I guess that was two separate questions Pamela. Pamela: Yeah and they actually have two very separate answers. If you walk around the astronomy departments in most universities or you’ve got to go to a meeting of the American Astronomical Society or any other astronomical society you’re going to look out on a room full of Mac Book Pros and iBooks and Macs everywhere. Pamela: I have a Mac Book Pro sitting in my lap right now. Fraser: So do I. Now is there some specific software application that they love to use? Pamela: All of our software was originally developed for UNIX so we have software like IRAF and AIPS. Mathematica works well. We have all sorts of handwritten codes in a lot of cases that get passed down from advisor to student. Just all sorts of simulations, everything originally written for UNIX, but UNIX is not user-friendly necessary so people moved on using Linux. You still don’t have your power point presentations in Linux as easily. You can use Open Office. When OS-X came out and it is based on a Linux operating framework all of a sudden everything got easier. I think just systematically all of us are moving over to the OS-X operating system running Leopard. We’re looking forward to Snow Leopard because it allows us to run all of our happy little command line tools and still have at the same time the power of all the Adobe suite products, Microsoft Office products and all of the other really nice commercial software that is out there that works on Apples. Fraser: When you do your research papers, they’re all done with LaTeX. Pamela: That works just fine. I’m running Tech Shop on my Mac and life is good. Pamela: It is a crazy mark-up language. It’s like writing a document in something even more insane than html. Fraser: Yeah, it’s a way of really carefully controlling how your document is going to look because you need to have all kinds of crazy formulae and pictures imbedded inside of it. It’s a standard that all astronomy – I don’t know if all research papers use it – but all astronomy ones do. If you don’t know how to prepare a document in LaTeX then you’ll never get published. Okay so what’s best for astrophotography? Pamela: There we’d start finding that it is actually Windows systems that often have the best software. This is mostly a matter of a lot of the telescope drivers, a lot of the telescope control systems all of those are programmed to run in Windows. If you have the software Bisque Paramount mount for your telescope that runs a whole windows system. Here it is just a matter of who created the hardware, what operating system are they using, where do the drivers exist. A lot of the software that supports the cameras was written originally for Windows. Here you’re seeing a lot of really good computer scientists who are astronomy hobbyists writing really useful tools in their spare time. Because they’re commercial software developers, they’re working in a Windows environment. Fraser: It is funny how much of this is just a legacy thing. Things get brought forward from previous sort of generations and so with the Mac Books it’s because it supports the UNIX that that’s what people use. With the Windows it is because the telescope manufacturers provide their interface for Windows because that is what most people run. This is sort of as dark energy is expanding the universe and creating I guess more space in-between is new space for vacuum energy being created? Pamela: This is one of the great mysteries that is right up there with the dark energy. We know that there are about 3 protons of energy per cubic meter of space. Exactly where these new cubic meters of energy come from as the universe expands is still a bit of a mystery. We tie it down to there is a static field that permeates all of space and it is as the universe expands against this field all the energy just comes into being. But it’s all a very unsatisfying answer and we don’t really have observational ways of testing anything so we’re sort of relying on the math. That’s always a scary uncomfortable place to be. This is sort of the newish theory about the formation of the moon that just a few hundred million years after the formation of the Earth a Mars-sized object collided with the Earth and the shrapnel of that collision was the moon. It sort of cooled down, hardened and became the moon orbiting the Earth. I guess the question then is would a collision of that scale affect the Earth’s rotation? Pamela: Yes. We just don’t entirely know how. We weren’t there to see the angles of the collision, to know the exact differences in velocity between the two bodies. We do know that it would have changed the Earth’s rotation. It probably changed the Earth’s tilt and unfortunately the collision erased the exact initial parameters of the planet Earth. Fraser: So, the Earth could have been rotating faster than it does today and then the collision slowed it down if it was going in the opposite direction. Or, the Earth’s rotation could have been slower and the collision could have sped it up, is that right? Pamela: Yeah. We just don’t know which. I doubt we were going backwards like Venus simply because conservation of momentum and the way in which our solar system formed would have led all the planets to initially before they got whacked and whacked and torqued and everything else to all be rotating in the direction the Earth is rotating in now. Fraser: Right then a situation like Venus it would have gotten a monster collision of its own and that would have reversed the direction of its rotation. This is Venus rotates backwards compared to the other planets. Although not very fast, I think Venus takes a half a year to complete one rotation on its axis so it isn’t very fast. Let’s move on to the next question. Pamela: We wouldn’t have Jupiter anymore? Pamela: [Laughter] Sorry, I couldn’t resist. Fraser: What would happen to the sun? Pamela: The sun would get a bit bigger. It would end up with a different pattern of lines in its atmosphere. If you look at the sun and you divide the energy out into a rainbow using a spectrograph, a prism a grism, a grating of some sort, as you looked at the new rainbow of light coming from the sun’s atmosphere you’d see that set of lines enhanced by the composition of Jupiter getting thrown in. Now Jupiter is awful small. Fraser: Jupiter is like hydrogen and helium anyway. Pamela: It does have trace amounts of other things. While Jupiter itself is very small compared to the sun’s atmosphere, it still could add some sort of enhancement that we’d be able to see for a period of time while the atmosphere mixed. Fraser: Would we see some kind of explosion on the surface? A flash? Pamela: It is hard to tell exactly what would happen. It would depend on the velocities at which it is coming in. It would depend on where it hit on the sun. It would definitely do some fairly nasty things to the magnetic field because it would probably create eddys. It would probably change the differential rotation of different parts of the atmosphere. Shock waves move through it, there would be badness but it would be very temporary badness. The sun is a star. It will happily go on with life. Stars have eaten planets before and will eat planets again. I think the greatest sadness is we’d have no more Jupiter. Fraser: We would have this sort of interesting brief astronomical event and then that would be that and the sun would just go right back to business as usual and we’d have no Jupiter. Sorry Jupiter. Thanks Pamela, we will talk to you for our next regular show. My friends tell me that you cannot see a satellite after 1:30 a.m. Is this true?